Our bedrooms are beautiful sanctuaries where we relax and recharge every day. Making this space as cosy as possible is simply a matter of paying attention to the details. 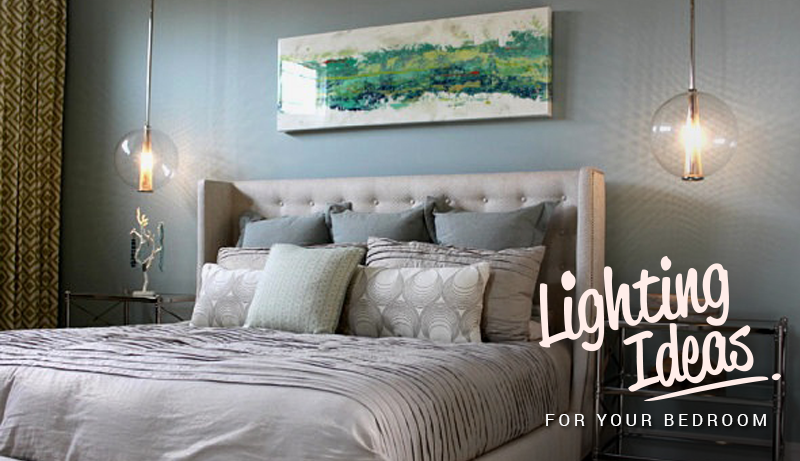 The perfect lighting can complement and adjust to your mood, no matter what sort of day you are having. To start with the basics, ambient lighting should mimic natural light. This type of light is ideal for beginning afresh each morning and winding down properly at the end of every day. On the other hand, accent lighting helps highlight a favorite art piece or furniture. There are so many ways to get lighting all wrong, but there are also enough ways to simply nail it. We share some of our quick tips and tricks with you, below. When considering lighting options, remember to keep in mind the scale of the room and the height of the ceiling. Evenly spaced, recessed lights can offer a feeling of being in a luxury resort. They also provide complete control over the amount of light required and the spotlit points of the room. A great way to clear up bedside table space and get those precious moments of night time reading in is by removing your bedside lamp altogether. The trick is to add a pendant light directly overhead, that will give just the right amount of light you need while you race through the latest best seller! When it comes to getting in the mood, nothing offers the best and most flattering lighting than subtle wall sconces. They offer a glow that looks like candlelight, which should be a must-have for any bedroom! Discern Tip: Try mirrored sconces to add a sleek and simple decorative element to the room. If you change the bulb to a colored one, the resulting light will be softer on the eyes. "Chandeliers are the jewellery of your home; whether small or large, they add drama to any room," says Jamie Laubhan-Oliver of D Home. If there is one place in your home where you should be allowed to go decadent, it's your bedroom. Indulge yourself and pick a chandelier that doesn't overwhelm the available space, but which will add a touch of immediate elegance. Try to get one that works on a dimmer, so you can modulate the lighting as you see fit. Have any fun lighting tips to share with us? Talk to us on Twitter, Instagram and Facebook @DiscernLiving.